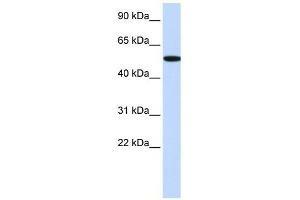 RIPK2 antibody (70R-10459) used at 0.2-1 ug/ml to detect target protein. Background RIPK2 is a member of the receptor-interacting protein (RIP) family of serine/threonine protein kinases. It contains a C-terminal caspase activation and recruitment domain (CARD), and is a component of signaling complexes in both the innate and adaptive immune pathways. It is a potent activator of NF-kappaB and inducer of apoptosis in response to various stimuli. Synonyms: Polyclonal RIPK2 antibody, Anti-RIPK2 antibody, receptor-interacting serine-threonine kinase 2 antibody, CARD3 antibody, CARDIAK antibody, CCK antibody, GIG30 antibody, RICK antibody, RIP2 antibody.